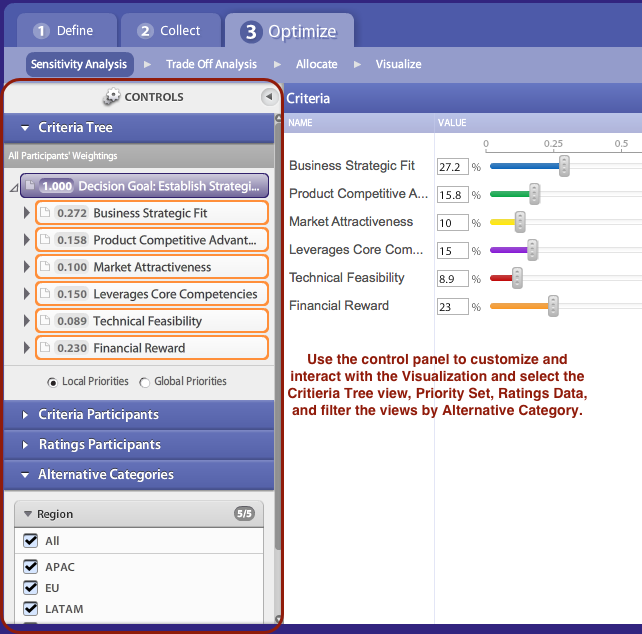 The Control Panel located in the Optimize Screens (Sensitivity Analysis, Allocate, Visualize) provides an ability to customize the analysis to be able to look at the decision from multi dimensional viewpoints. This allows, for example, the ability to look at sensitivity results for the Priorities of one Participant Group (e.g. Executive team) vs the Alternative Ratings of a different group (e.g. Operations) and to filter to only a subset of Alternatives as desired. The different filtering mechanisms are available in the Control Panel on the left side of the screen and include, Criteria Tree, Criteria Participants, Ratings Participants, and Alternative Categories. The Control Panel itself it collapsible to hide when not needed as is each individual section. Criteria Tree – This section of the Control Panel allows the user to drill down to lower sub sections of the criteria tree to analyze the impacts of sensitivity changes on the child and parent criteria. Criteria Participants – This section of the Control Panel allows the user to change criteria priority calculations based on the varying inputs of either individual Participant, Participant Group, or Custom Priority Set. Ratings Participants - This section of the Control Panel allows the user to change alternative ratings calculations based on the varying inputs of either individual Participant or Participant Group. Alternative Categories - This section of the Control Panel allows the user to filter views to only show specific Alternative Category(s) within or across Category Groups in order to manage through sub portfolios. When selected, any Control Panel Filter will display a ribbon on screen to clearly communicate that the data view has been customized. Clicking on the [x] on the right side of the ribbon will reset the specific filter setting back to All Participants or All Alternatives as appropriate. Selection of a Criteria participant or Ratings Participant Filter will result in changes to underlying calculations. When selected, the orange Allocate button will be enabled signifying the user to re-run the allocation scenario. Filtering by Criteria tree and/or Alternative Category will only filter screen display and does not impact calculations. NOTE: If the inputs for multiple individuals is desired, then the user needs to create a new group with those specific individuals as members.